I have always been drawn to the rich open voice of a 12 fret guitar. It really does place the bridge in that golden ratio sweet spot and allows the top to reach its full potential. The tradeoff of course is the more difficult approach to the upper register for the fretting hand with only 12 frets clear of the body. Nothing some good technique or perhaps a cut-away can’t overcome. 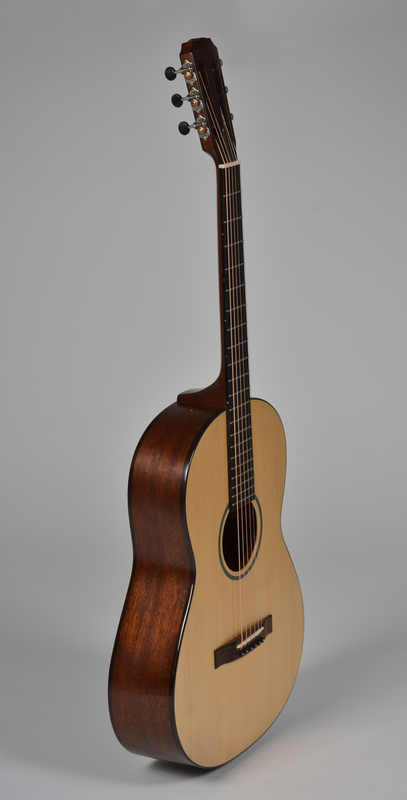 The Engelmann Spruce top lends itself perfectly to fingerstyle music with lots of separation between the notes and an immediate attack that requires very little energy to move the top. With a slightly wide nut width the feel and string spacing of the Classic Steel lends itself perfectly to a chord melody arrangement, a fugue, a Bossa Nova or some sweet old time Piedmont Blues. Running the line between a OO, a OOO, a Nick Lucas, and a Spanish Classical – this 12 fret guitar sings all on it’s own.